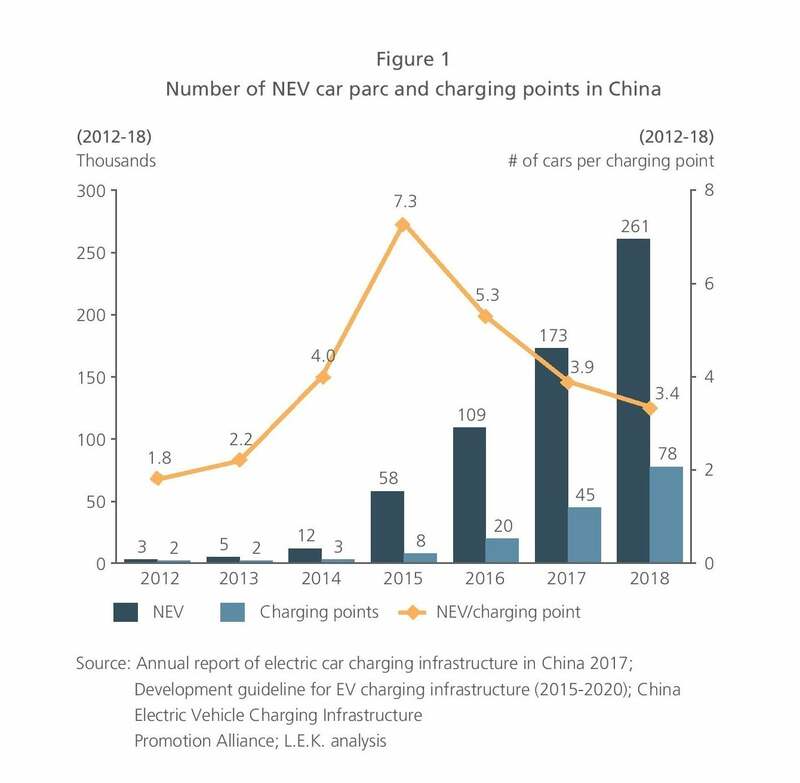 By the end of 2018, China’s new energy vehicle (NEV) ownership had reached 2.61 million (including both passenger and commercial vehicles), with a compound annual growth rate of 120% over the past five years. However, the construction of charging facilities in China is not keeping pace, which is impeding further development of the NEV industry. Most NEV owners in China rely on public charging stations. Their charging experience is far from ideal and is unlikely to improve significantly in the short term. How can NEV original equipment manufacturers (OEM) improve customer experiences through innovations in business models, service offerings and app functionalities to continue driving NEV adoption? 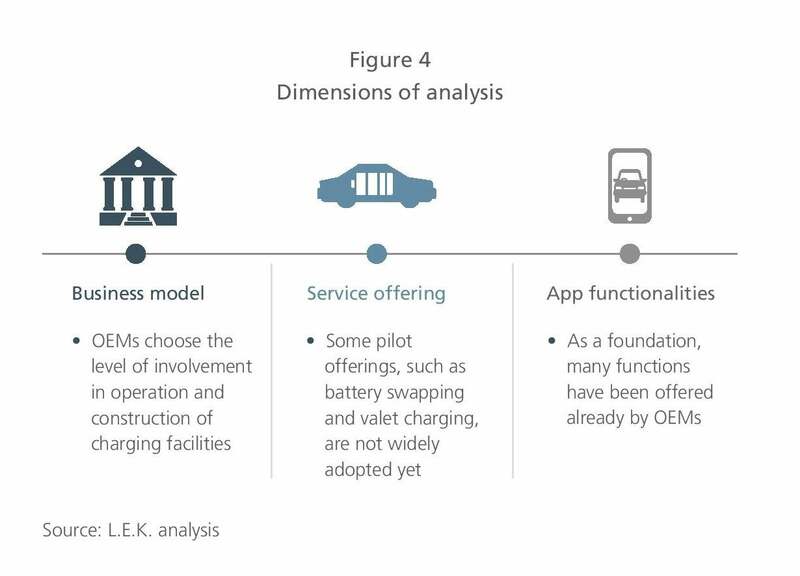 This paper presents a comparative study on mainstream approaches that OEMs adopt and proposes corresponding strategies to improve customers’ charging experiences. 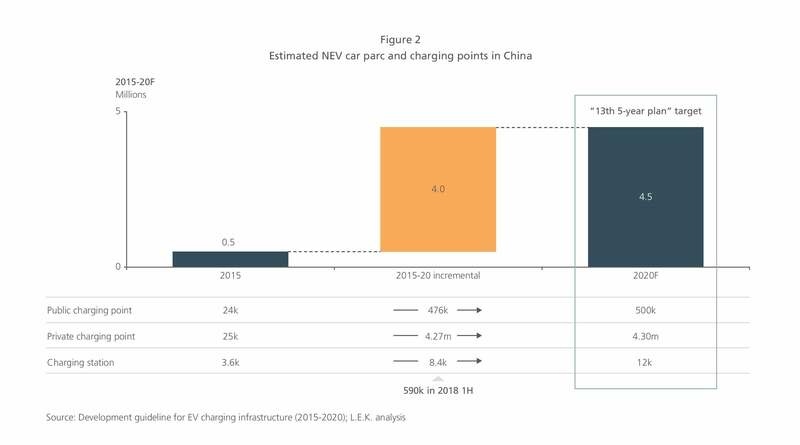 China’s charging infrastructure is severely lagging relative to the rapid growth of NEV ownership. Currently, each charging point needs to serve 3.4 NEVs (see Figure 1). For private charging points, due to infrastructure constraints, the penetration rate is still low at ～22% and is expected to remain so in the short term. The National Energy Administration set a target of building 700,000 private charging points by 2017, but only 40% of that goal was realized. Two factors are restricting private charging points: insufficient private parking spaces in which to build private charging points and insufficient power capacity at residential communities. The public charging infrastructure market is still in an early “cash burning” model, with low profitability posing a serious challenge to charging point operators (CPOs). Undesirable locations: Charging points/stations installed near CBDs and residential communities where the traffic volume is high tend to achieve higher utilization rates, but most charging facilities are not ideally located. Low utilization rate: Public charging points have a mechanical failure rate of 3%. Meanwhile, usage time of public charging facilities is highly concentrated. The overall utilization rate of public charging points is less than 15%. It is estimated that CPOs can break even only when the utilization rate exceeds 30%. Hence, we believe it is difficult to achieve the target of 4.8 million charging points and a one-to-one NEV-to-charging-point ratio by 2020 as set by the government (see Figure 2). 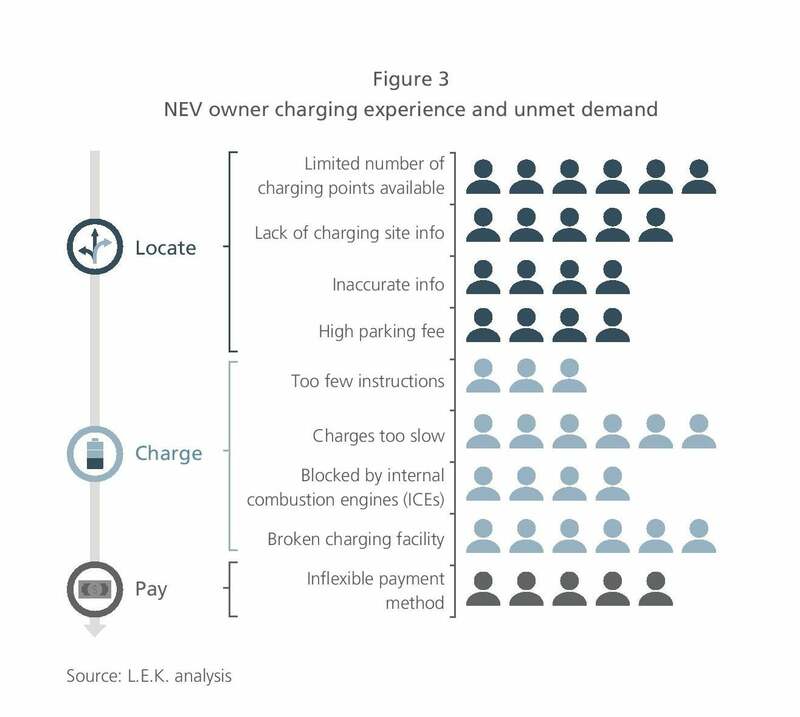 Therefore, despite most NEV owners relying on public charging points, they are facing significant pain points in the “locate,” “charge” and “pay” process of their charging journey (see Figure 3). 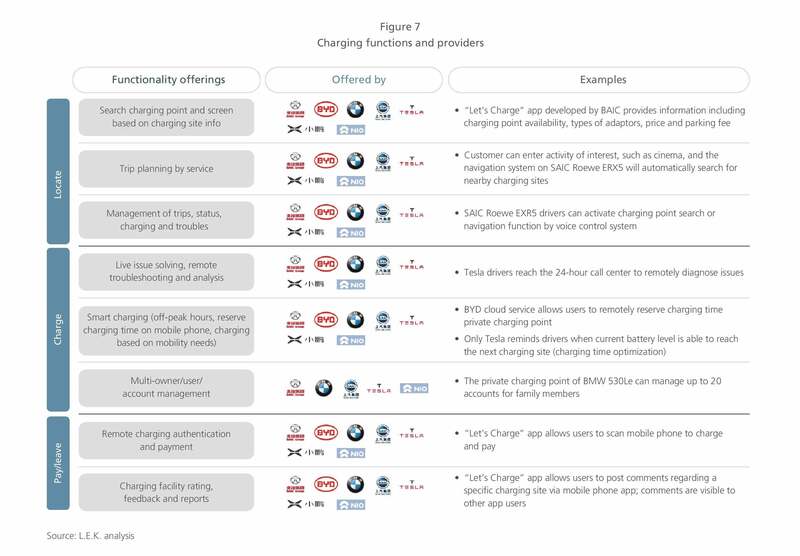 Major market players adopt various strategies to improve charging experiences. We analyze their approaches from three aspects: business model, service offering and app functionalities (see Figure 4). 1. In terms of business model, more and more OEMs choose a light-asset model and stay away from construction and operation of charging facilities. 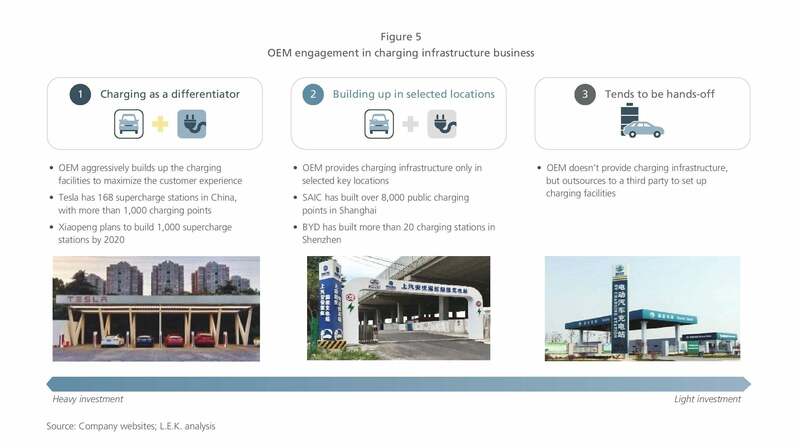 OEMs typically choose to expand charging networks in one of three ways: self-build on a large scale, self-build in selected locations, or use a hands-off, light-asset model (see Figure 5). Fewer and fewer OEMs choose to self-build a large-scale charging network. Traditional OEMs are facing sales and profitability challenges, and emerging NEV OEMs are facing capital constraints. Nevertheless, a light-asset model does not mean completely giving up all control of the physical charging network. Effectively leveraging third-party charging resources, obtaining real-time charging information, and launching innovative value-added services based on collected data will become the key for OEMs. 2. In service offerings, some OEMs have made a few innovative attempts. However, the actual economics are rather questionable (see Figure 6). It is challenging for mobile charging vans and valet charging services to become mainstream. These services are more applicable to special use case scenarios such as emergent road assistance. They require high capital and labor investment. The cost of a single trip by a mobile charging van is RMB 250-300, while customers usually pay less than RMB 200 at a charging station. A typical mobile charging van runs three cycles per day and can charge six cars per cycle. As the number of mobile charging vans increases, the total cost grows proportionally, making it difficult to achieve economies of scale. For OEMs that currently provide such services, the utilization rate is only 20%-30%. There is a limitation of charging power. Due to limited space within a mobile charging van, the built-in generator can reach only half of the fast-charging power. Although unlikely to become the mainstream charging services, mobile charging vans and valet charging services can be positioned as a marketing tool that alleviates customers’ range anxieties. For example, a mobile charging van can deliver charging services across different geographical locations. It provides an alternative for NEV owners under emergency situations, easing range anxiety. A battery-swapping service is more suitable for fleet owners, such as taxi or ride-hailing service providers. There are several challenges when applied to private vehicle owners. Operation mode: Battery packs lack standard design, which means the battery-swapping machinery can be used for specific car models only. The investment is big, making it hard to realize a profit: The upfront investment includes RMB 1 million construction cost, RMB 80,000-100,000 per battery pack, RMB 20,000-30,000 per month site rental fee and RMB 8,000-9,000 per month in labor. A typical battery-swapping station also needs around 10 backup battery packs. Furthermore, training, R&D and security require large capital investment. Opportunities exist for fleet owners, such as taxi, bus or ride-hailing service providers: Fleet operators use identical car models, providing economies of scale. For instance, BAIC has completed 8 million battery-swapping services for taxi and ride-hailing fleets across four cities and 116 stations in China. Innovative charging technologies such as wireless charging and robotic charging arms are still under development. In China, BMW offers 100 wireless charging sets, targeting premium customers with private garages. The charging process begins as soon as the vehicle has been parked in the correct position above the inductive charging set. Meanwhile, companies such as Starcharge are actively developing robotic charging technology. Built on a visual recognition system, the robotic arm can automatically recognize and plug into the parked vehicle. Fully automated charging can be realized when combining a robotic charging arm with auto-parking and a voice control system. 3. In terms of app functionalities, all have rich features, but they lack a differentiating design. Most available apps provide highly similar functions, concentrating on charging point search, charging information collection, smart charging, multiuser management and remote payment to meet basic customer demands (see Figure 7). 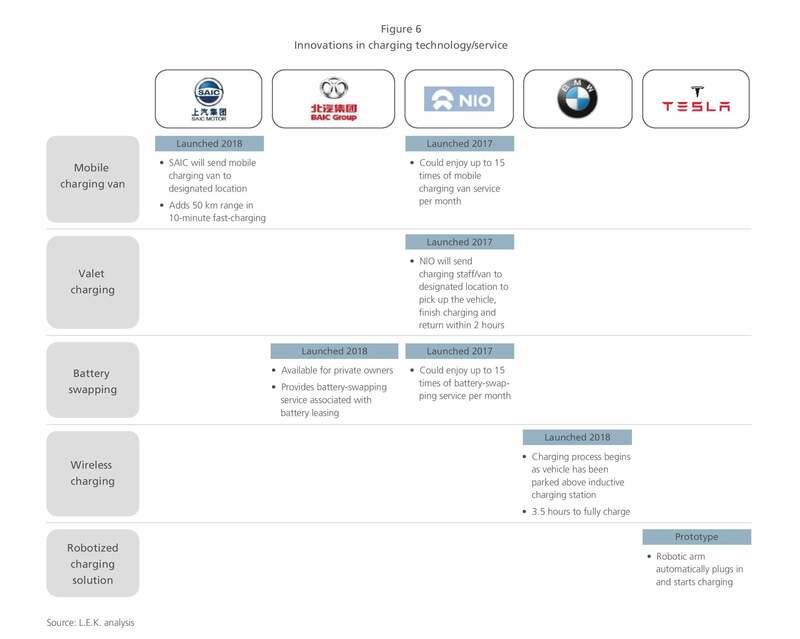 Figure 7 summarizes charging app functions recently launched in the market, including charging point locating, remote problem-solving, and intelligent time management of private charging points. 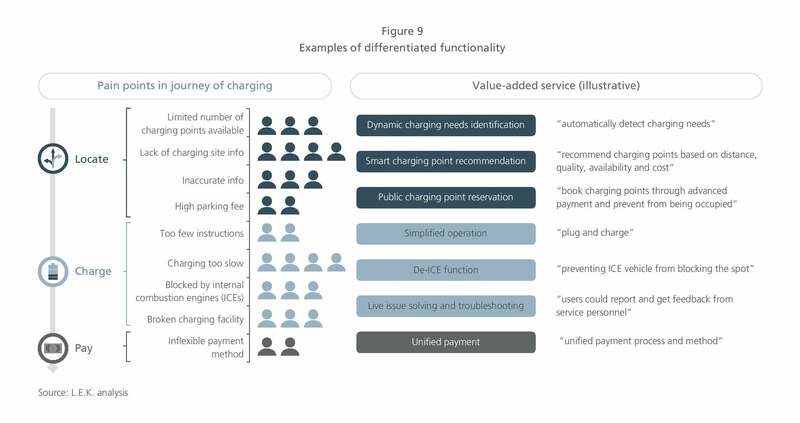 Nevertheless, customers still want functions that directly address their pain points, such as de-ICE function, and functional public charging point recommendation and reservation (please refer to the last section of this article for more details). Although a few OEMs have made some attempts, such functionalities have not been widely promoted because they require close collaboration among the OEM, CPO and parking lot operator. 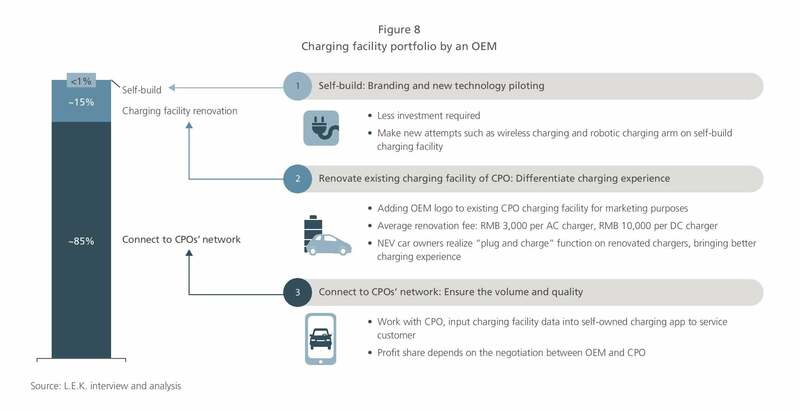 Facing the long-term gap between rapid growth of the NEV industry and sluggish construction of charging infrastructure, OEMs should identify their differentiated competitive advantages from three aspects: business model, service offering and app functionalities. For premium brands, some OEMs can consider selectively building public charging points and aggressively launching new technologies and services to create differentiated customer experiences. For the majority of mass-market-focused OEMs, however, the key is to integrate services from CPOs and create seamless customer experiences. 1. In terms of business model, whether to build a physical charging infrastructure should depend on the OEM’s strategy and investment appetite. Although the light-asset model is becoming predominant, OEMs can help build their market premium brand image through selectively building their own charging points and investing in new technologies. For example, a leading OEM invested in charging facility renovation together with CPOs and a small portion of self-build charging points (see Figure 8). This mixed charging network allows for both brand promotion and customer experience improvement with limited total investment. It is imperative to integrate public charging resources at the app level for OEMs. Existing apps are mainly provided by CPOs and third-party service integrators. However, the market is fragmented and data quality is very poor. Lack of motivation for data sharing among CPOs. Major CPOs have built their own apps to collect charging-related information, and they share part of the data with each other according to government regulations. However, given the competitive market, it is not commercially logical to expect CPOs to fully share and update real-time data with each other. Third-party service providers lack the core resources necessary for full integration. Some early movers (such as Powerlife in China) have taken significant market share with reasonably good quality of data by combining data from various CPOs within regions. But such companies lack value chain control of both the upstream network and downstream NEV owners. It’s hard to expand across regions in order to cover the whole country. For OEMs, it is easier to integrate physical charging resources at the app level by leveraging their customer resources. Connected vehicles and services are natural and convenient interfaces for locating charging points. OEMs can leverage NEV traffic data as a bargaining chip when negotiating with major CPOs to achieve better data integration. Rather than importing functions and data from third-party platforms, OEMs can work directly with CPOs to ensure charging point quality and distribution. A self-owned app platform can become a core competitive advantage. In fact, when collaborating with the top five CPOs by market share, one self-owned app platform can cover more than 80% of the charging resources. 2. In the area of service offerings, OEMs should select from among various innovative charging modes, choosing the one that fits their branding image and target customers. If mass-market targeting, such services as mobile charging vans, valet charging and battery swapping will need detailed cost/benefit analysis. Mobile charging vans and valet charging services could be a burden to profitability given unproven user demand, making them more suitable for road emergency services for the mid-to-high-end market. Battery-swapping service is more applicable to fleet owners. Pilot projects at selected locations for major fleets are suggested. New technologies such as wireless charging can be tried when they are ready. However, they may not be able to address primary customer pain points. In the longer term, dynamic wireless charging based on the road or highway may be more promising. 3. In terms of app functionalities, we believe OEMs still have room for innovation and differentiation. OEMs should offer features that target specific pain points along the charging journey. Here are some examples (see Figure 9). Close cooperation with CPOs is required in order to launch innovative functions. As NEVs are becoming increasingly connected and intelligent, OEMs should understand the strategic importance of building a seamless and differentiated charging experience to continue driving NEV adoption. It is imperative to have the business model, new technologies and service offerings, and app functionalities that match the overall strategy. Participation in the MaaS landscape is complex and will require various strategic decisions to be made.